Zen and the Art of Motorcycle Maintenance is one of the most successful automotive titles ever written, having sold more than five million copies and although its author Robert M. Pirsig admits “It’s not very factual on motorcycles” the global success of the work is one of many proofs that our passion for Motorbikes is more than just a hobby. It’s rooted in family and community, fraternity and adventure, it can bring us our greatest highs and for many it’s our therapy at our times of greatest need. 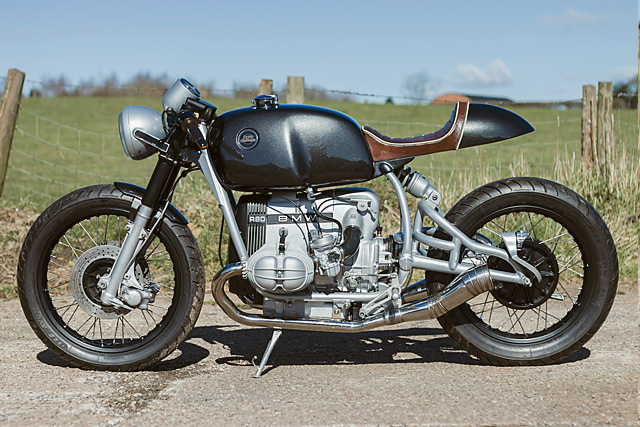 For Craig Jones of Warwickshire and his meticulously crafted 1980 BMW R80 this build has been both a way to cope with great loss and the beginning of a bright new journey. From the age of 8 Craig has had a passion for motorcycles that started with his first ride, a Yamaha YZ80 and is a love that has never abated. His other love is working with metal and for 25 years he worked alongside his Father in their family owned Blacksmith and Fabrication business. But life has a way of taking cruel turns and just nine months after a cancer diagnosis his Dad passed away. If that wasn’t enough the business had to be closed down, Craig lost his home and his relationship broke down. But with a new partner, a little shed at the back of the Garden and a BMW in his possession Craig wasn’t about to let life beat him down and put his 25 years of experience to work. 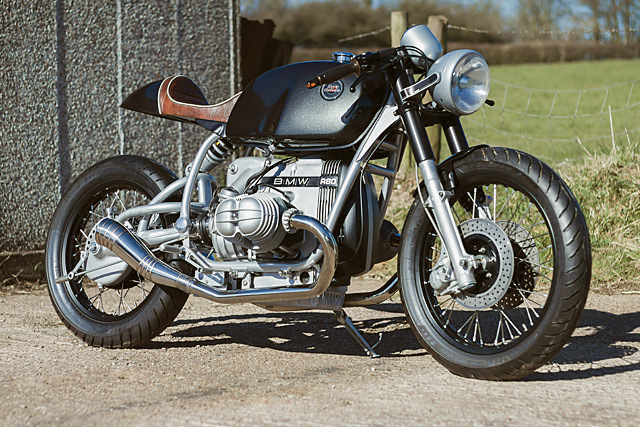 Conscious of the number of R series BMW’s that have been customised of late Craig made high quality the theme of the build. 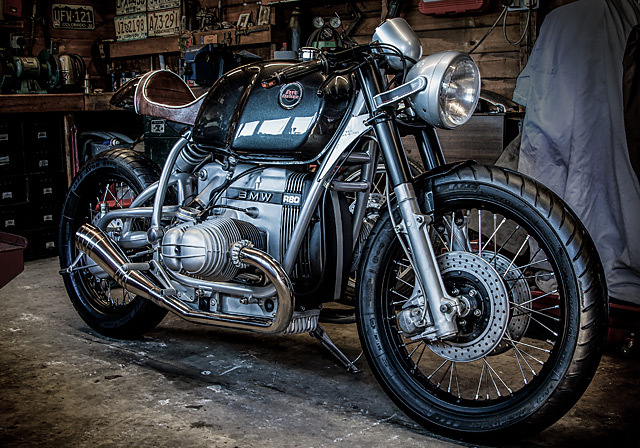 Stripped of the panniers and all the plastic junk he started with a bare frame and set about improving it so well the Bavarian boys would blush. The frame has been completely smoothed out, not just detabbed and generally cleaned up but worked over in only the way a skilled Blacksmith can until all the metal surfaces were perfect. Not wanting to use the stock subframe or have a swingarm like everyone else Craig then set about creating a beautiful single shock conversion and a heavy focus on the bracing to match the look of the engine. 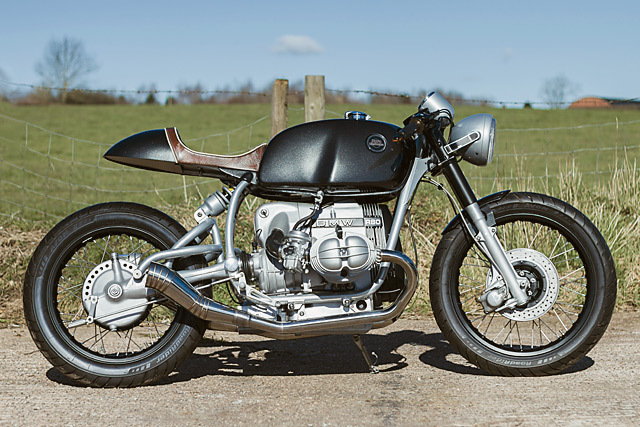 “All the welds were painstakingly dressed in to keep a very clean look” so clean in fact the connection between the shock and the swingarm itself appears almost hidden. 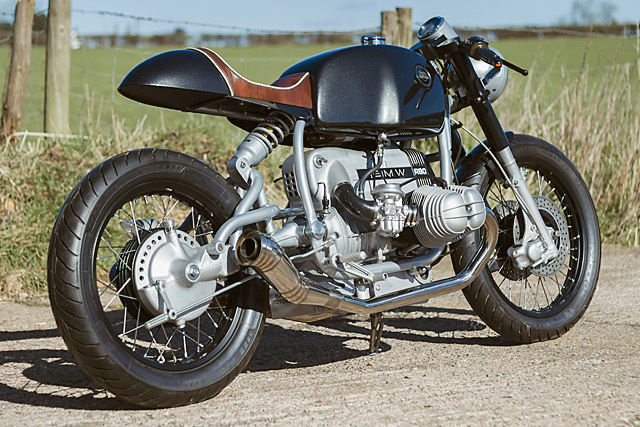 To ensure all his fabrication efforts wouldn’t be cluttered by a numberplate and tail light their own housing has been meticulously crafted and sculpted and then side mounted just above the axle line. All the metal work was then blasted before the frame and swing arm were powder coated with silver and a powdered clear coat for a durable finish that still shows off the incredible workmanship. 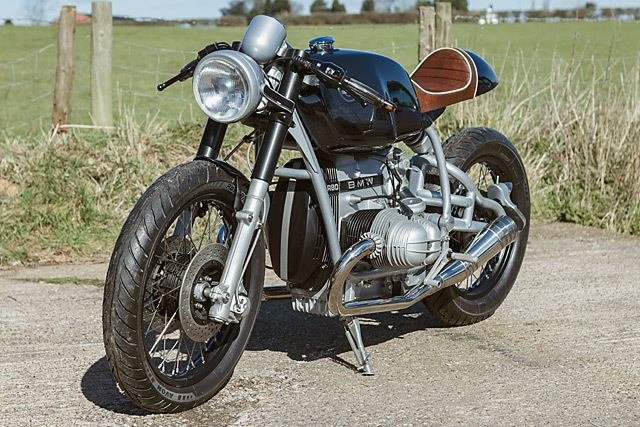 Craig then turned his attention to the front of the bike, first considering a switch to an USD fork conversion, but wanting to maintain some of the BMW characteristics he decided to work with what he had. With the conventional telescopic forks in place he stripped them of their rubber gators and fabricated steel tubes that act as covers and drastically improve the look of the forks. 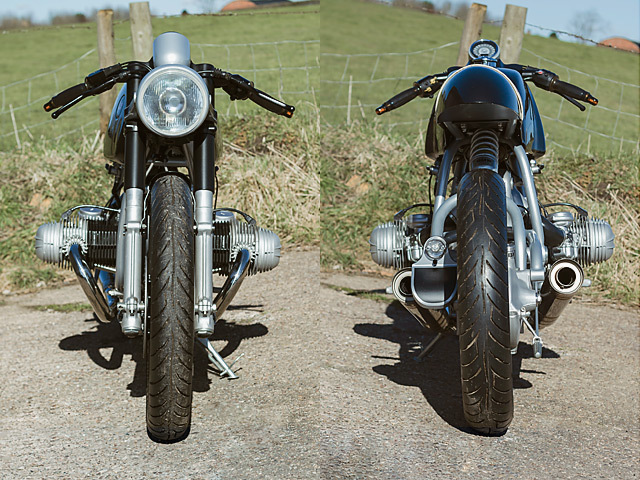 The BMW upper triple clamp is no pretty piece, so having gone to all that effort on the forks Craig then fabricated a shroud to cover the yoke that also acts as the speedo pod and is attached with hidden fixings. 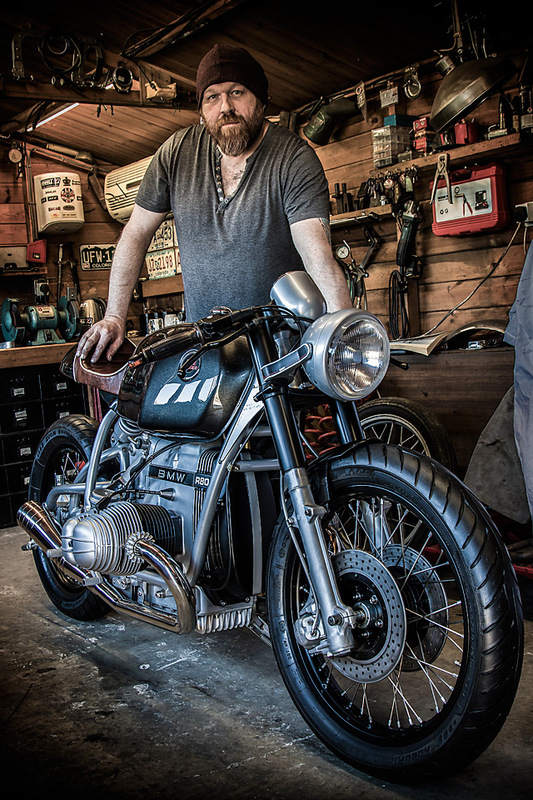 You could stop there and be pretty happy with your efforts on the front end but Craig’s mission wasn’t done and with some 2mm plate in hand he fabricated headlight brackets that appear to float in mid-air with no visible attachments. The headlight itself was smoothed out to perfection and along with the speedo wears frame matching silver with the rest of the front end dressed in black. With such a beautiful rolling chassis Craig wasn’t going to let the bodywork let things down and the tank is arrow straight and now wears a Monza style filler. But it was the tail section where he really focussed his attention, The seat unit itself comes from Vonzeti but is mounted to Craig’s own extremely thick-walled tube loop to do away with a tube gusset and keep the lines clean. 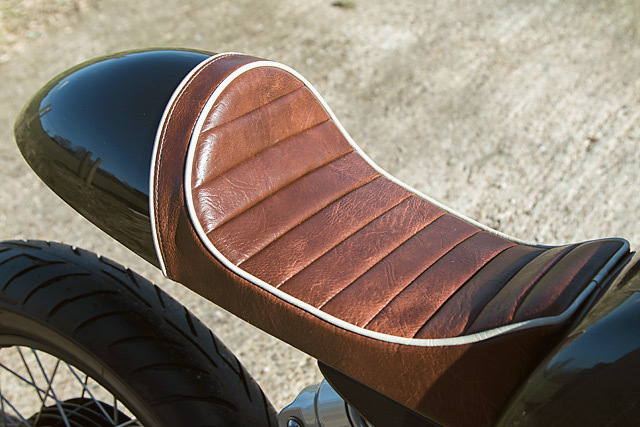 He then fabricated slim side panels that shield the seat to tank join and wrap neatly around the frame tube to avoid the look of many seat units which appear to simply be slapped on. Under the seat hump hides the fuse box, flasher and all the electrics, with a custom boxed fabricated to hide the battery under the transmission. The body work was then handed over to friend Dave Reade who laid down the Aston Martin paint in a finish as flawless as the rest of the build. With such a stunning machine to ride Craig couldn’t well let the BMW engine remain unchecked and clearly not one to do things by halves the motor was completely stripped down for a full inspection. The 797cc Boxer twin had all its worn out parts shown the door with replacements fitted and rebuilt with new gaskets and seals throughout. New leads, silicone hoses and rubbers ensure he’ll never be stranded on the motorway and the block has been cleaned up within an inch of its life. To give interested spectators a heads up that he is about to pass-by the dorky standard BMW mufflers are gone and the Bavarian now barks through a slick pair of GP style pipes. 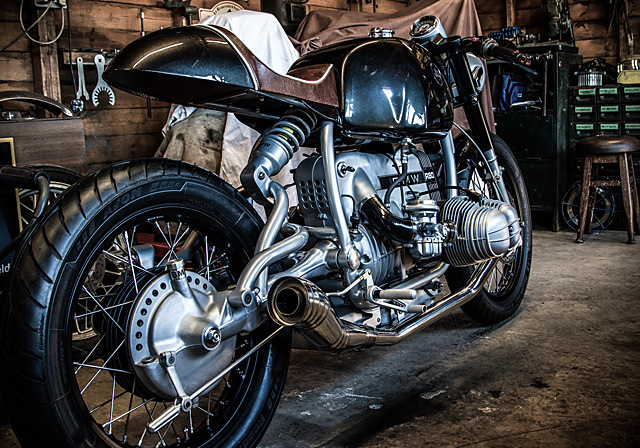 Sitting just above the new pipe work are a set of custom fabricated rearsets that in a raw metal finish blend seamlessly into the frames silver coating. Sheds. Is there anything they can’t do? 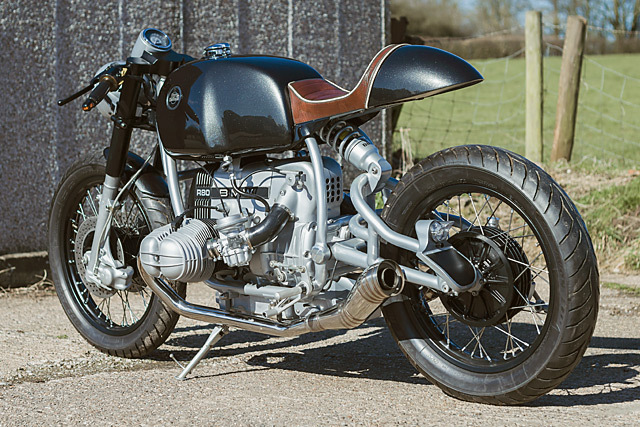 Craig’s bike had originally come with the BMW snow flake wheels but they aren’t to everyone’s taste and certainly didn’t fit the theme of the build. So after a bit of searching he found some spoked wheels that looked like they had been given the Mafia treatment and buried in a swamp for 20 years. But after a strip down, blasting and powder coating he rebuilt them with stainless spokes and new bearings and now out of the witness protection program they look brilliant wearing Avon Roadrider rubber. The finishing touch to the build are the AVRO customs tank badges that will forever more let the world know just who built this bike. “I’m just a guy building bikes in the garden shed, maybe one day it will turn into something different.” With quality of workmanship this high, fabrication skills most would kill for and a rolling example of his brilliance it’s fair to say Craig’s luck has finally turned and I’m sure this won’t be the last time we see a bike wearing an AVRO badge!